STILL USING THE SAME STANDARD BOILER? IT’S TIME TO CHANGE. CHOOSE TOTEM, SMART HEAT AND POWER! 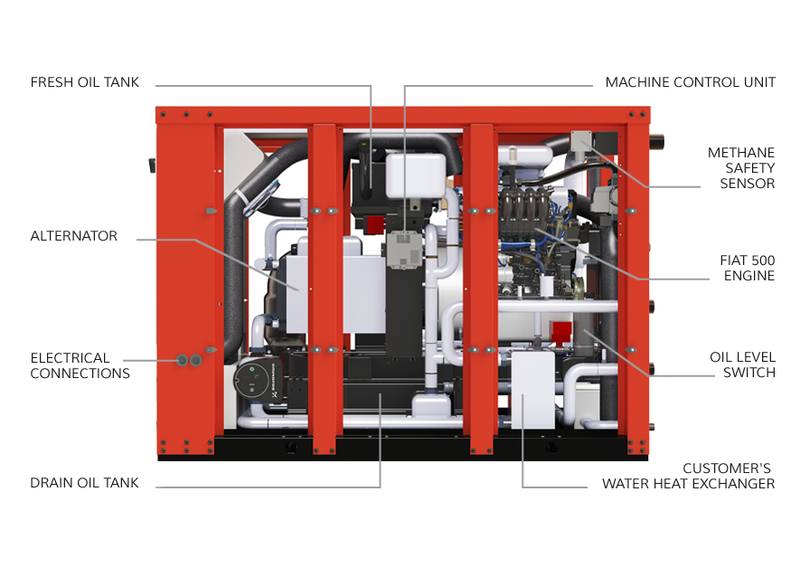 The TOTEM is a high-efficiency micro-cogenerator powered by natural gas that produces heat and electricity while protecting the environment. the TOTEM is the evolution of the first micro-cogenerator in the world designed by the FIAT Research and Development Center in 1977. The heart of TOTEM is the innovative gas engine of the FIAT 500, manufactured by Fiat Chrysler Automobiles which is coupled with an alternator for power production. 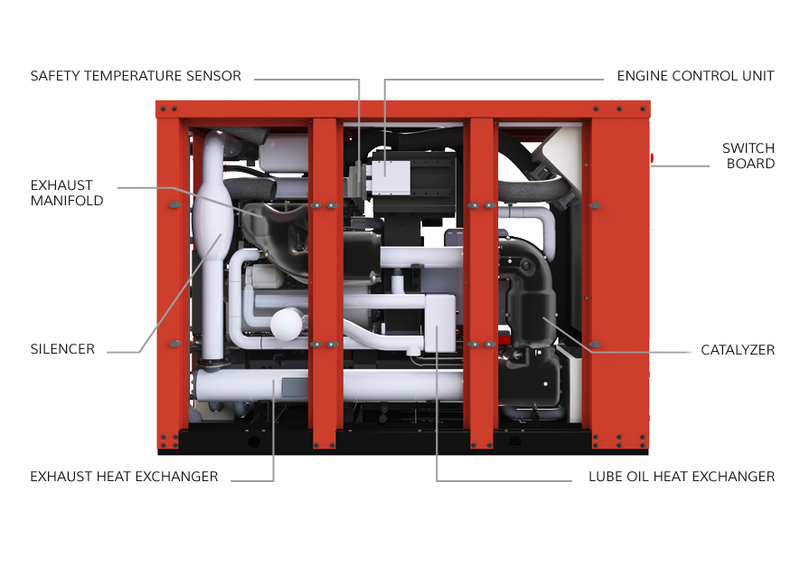 The heat otherwise wasted is recovered from exhaust gases, cooling water and lubricating oils through an efficient heat exchanger system and made available, to the users’ needs. The smart engine control system, Magneti Marelli, is designed to meet the emission limits EURO 6. The unit is managed by the TOTEM OS operation system that allows to do extraordinary things. 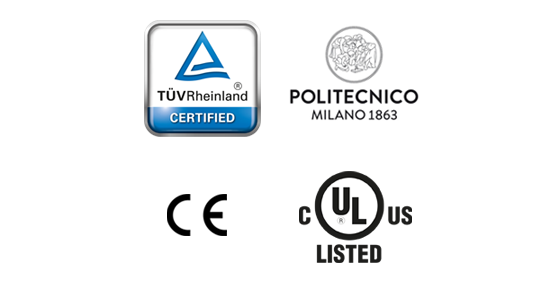 TOTEM is the first micro-cogenerator whose performances and compliances are measured by Micro-Cogeneration laboratory of Politecnico di Milano and verified by TÜV Rheinland that also certified TOTEM’s compliance with the most restrictive technical and safety regulations. TOTEM 25 BS version, designed for North American market, has achieved the prestigious UL certification. TOTEM systems fulfil already the most demanding efficiency requirements, introduced by the EU Regulation 811/2013 (energy labelling) in force from 26th September 2019. As a result, TOTEM is ranked at the top of its category, and exceeds by far the efficiency of the up-to-date condensing boilers. 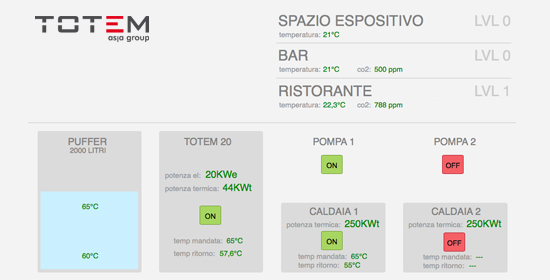 The TOTEM stands out for its “intelligence”: an innovative software platform designed for the Smart Building and modern control system and acquisition make it possible to coordinate and get integrated with current and future energy systems (solar panels, boilers, heat pumps, etc), allowing the entire system to achieve maximum efficiency. This feature makes it compatible with all electric heat pumps available on the market, which will benefit from the electricity produced at low cost by TOTEM, enhancing the savings to the end user. find it out in 5 minutes!